"How much does a backyard cottage in Seattle cost?" Not surprisingly, we get that question quite a bit. The correct, although frustrating answer is: it depends. It depends on your lot size and location, your lots topography, your existing utilities, access, desired size, level of finish etc. All of these will affect the total cost of your backyard cottage. Note that in Seattle, the city calls backyard cottages Detached Accessory Dwelling Units or DADU for short. We tend to use that terminology as well. Mostly because DADU is fun to say. While ‘it depends’ is the correct answer, it isn’t very helpful. If you are starting to think about building a backyard cottage, one of the first things you want to figure out is if you can afford it. With that in mind, we are going to take a look at some of the more recent DADU’s we have worked on and see if we can pull some usable cost data out of them to help people get a handle on how much they might need to spend to get a DADU. Whether or not you can put a DADU on you lot is another question. While all of Seattle residential zones allow DADU’s, your lot still needs to meet certain criteria to allow for a DADU. Some research is usually required to determine whether a lot is suitable for a backyard cottage or not. We are going to look at total construction cost (bricks and sticks), cost per square foot and associated soft costs. Soft costs are the fees associated with permitting, design, engineering etc. Basically everything other than bricks and sticks. It is worth talking about cost per square foot a bit before we start. Cost per square foot is a pretty common way to measure construction costs. The problem is that it makes the assumption that cost is directly related to size and that all space costs the same. This is not true in a standard sized house and very much not the case is DADU’s. In a ‘standard’ house you have expensive space (kitchens and bathrooms), and cheap space (hallways and closets). The cheap space offsets the expensive space and you get an average. In DADU’s, most of the cheap space has been removed and all that is left is the expensive space. When you are limited to 800 sqft of interior space, you make sure you don’t waste it on hallways and this pushes the cost per square foot up. Essentially, with a DADU, you have all the expensive parts of a house without any of the cheap space to bring your average down. We will still run the numbers to see how they come out but we are expecting it to be higher than a standard size single family house. Below are three common DADU types and cost ranges for each type based on our experiences. Type A is a two story full time home with some custom features and mid-grade finishes. 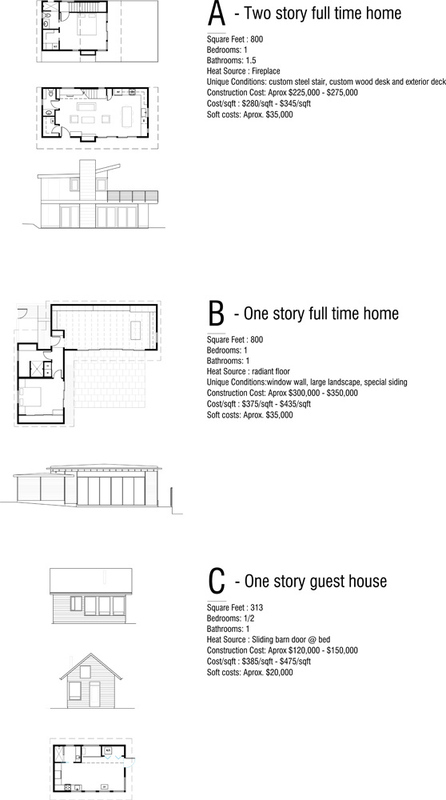 Type B is a one story full time home with higher grade finishes. Type C is a part time guest cottage on one floor with mid-grade finishes. As we said before, costs are dependent on the individual project but these should serve as a good guide to start with.